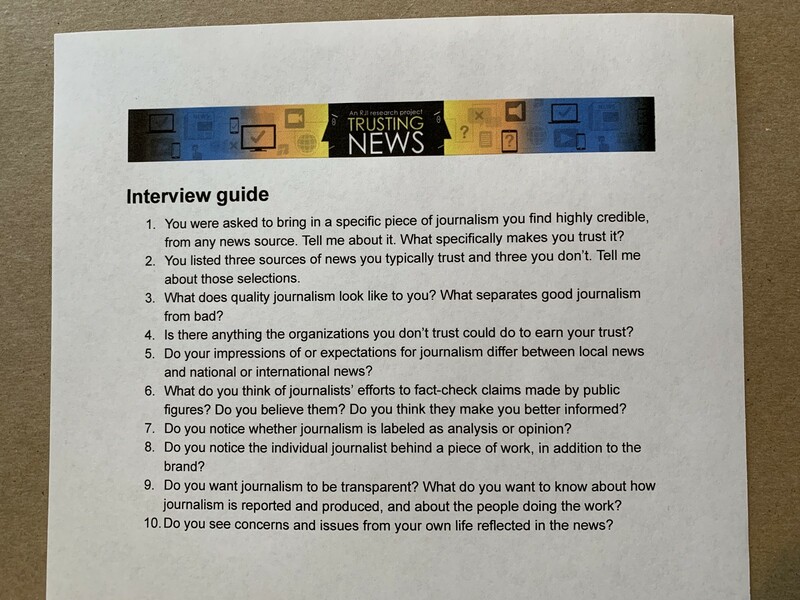 Volunteer journalists used these questions as the basis for a conversation with their own community members, and they recruited participants across a variety of demographics, political leanings and general likelihood to trust the news. Fundamentally, news consumers trust journalism they find to be balanced, in-depth, honest and reputable. In an earlier phase of our project, we recruited journalists to sit down one on one with their own news consumers to talk about trust. (The list of which news organizations participated is here.) The newsrooms first published a questionnaire designed to help them find users to talk to across a spectrum of age, gender, race, political leanings and overall likelihood to trust the news. Those questionnaires produced a lot of interesting information, which you can read about here. Our partner journalists then attempted to interview four people from across their diverse responses. They used our interview guide as the basis for the conversation and collectively sat down with 81 news consumers for about an hour each. What we learned in those interviews helped us get inside the heads of news consumers, and as a result we created the set of strategies we’ve been testing. We’re thrilled to now add to our body of knowledge a more formal analysis of those interviews. Rob Jones, a PhD student at the Missouri School of Journalism, looked for themes in the responses. This was an important step because the questions were open-ended. When we asked, for example, what the subjects think about journalists’ efforts to fact-check claims made by public figures, we didn’t offer a rating scale or multiple choice options. We just listened. The themes that emerged were things like whether the fact-check was useful, whether journalists were qualified to conduct it and whether fact-checkers kept the public interest in mind. Jones then did a deep content analysis of what we learned around each of the themes that emerged. Download his full report here. Participants were not given a list of qualities to choose from. These numbers reflect what they came up with on their own. It’s fair to say that most or all participants want their journalism to be honest, for example. But 52% of them mentioned honesty when asked to describe good journalism. The same qualities were listed when asked what news outlets could do to regain trust once it’s lost. Here’s more on some of these key themes. This concept is at the top of users’ wish list for quality journalism. Many people use it to mean that journalism should reflect a diversity of opinions. Others speak more specifically about how journalists should keep their own opinions out of their work. And some say they cultivate their own balanced news diet by consuming journalism from multiple sources. News consumers don’t want to be misled. They want clear attribution, good labeling of content and honesty around conflicts of interest on the part of journalists and sources. They also don’t like headlines and story details to be exaggerated or sensationalized. People who mentioned depth said they value journalism that provides context for a story and goes beyond the basics. They want journalism to go beyond the basic facts to help users understand where they fit into a bigger picture. News consumers want to make up their own minds. They don’t want to feel like they’re being told what to do. They also value information that empowers them to better live their lives and helps them make decisions. Some news consumers pay a lot of attention to whether a news product feels like it’s high quality (such as being well written, free from error and well sourced). Some also care about the reputation of a news organization or feel loyalty to brands they’ve long followed. Fact-checking: More users said they find fact-checking in general useful than not useful, though one-fifth of them said they question the integrity of the fact-checkers. Labeling types of content: It can sometimes be tough for news consumers to tell when something is straight news and when it represents an opinion. Participants said this was most likely to be confusing on TV. Transparency: There is an appetite for journalism to be transparent among more than half of the participants. When asked what they wanted to see, people talked most about wanting to understand how news is selected and learn more about individual journalists. Download the full interview analysis on the Reynolds Journalism Institute website. In February, we published research done with the Center for Media Engagement at the University of Texas at Austin. It found that adding a box explaining a story’s process can improve a user’s perceptions of a news organization. Research participants were readers of two newsroom partners, USA TODAY and the Tennessean. They viewed either a news article with a box or without and then were asked a series of questions about the news organization. In addition, the research participants who viewed an article with the box rated the news organization significantly higher on 11 of the 12 attributes of trust. These attributes include being more transparent, informative, accurate, fair, credible, unbiased, and reputable. This post was also published by the Reynolds Journalism Institute.